Any one ditched the external fuel pump and swirl pot set up, in favour of an oem in tank type plastic swirl pot/ pump combo? I'm looking for one that length wise will fit in the marlin tank. Having big fuel vapour lock issues with the swirlpot being next to the header tank and under bonnet temps of over 60 degrees. Causing the fuel pump to cavitate and scream! Also I hate the noise of the facet LP pump buzzing away. I believe it was Rob Dorey who had his tank altered to accept the OEM BMW pump into his Marlin Sportster tank. This involved recessing the top of the tank, making a screw collar in aluminium, and a sump in the bottom of the tank to accommodate the depth of the BMW pump. As far as I know no one else has pulled this off! I have no idea how his mate made the aluminium screw neck? Several of us have made a sump and welded it to the bottom of the tank - to eliminate the need for a swirl pot and LP pump. Simply run a HP pump located in the rear. I am looking to avoid modifying the tank. Most oem pumps have a swirlpot which needs no baffling / sumps in the tank! Just wondering if any one had found one that fits! It might be worth trying to understand why you are getting vapour lock issues with your current set up? If the HP pump is cavitating and screaming it suggests that you may have air trapped in the swirl pot, something it is designed to prevent. Have you checked the connections are the right way round as it would be easy to have them swapped from the swirl pot to the fuel tank. Does your fuel tank get pressurised in hot weather? The swirl pot connections are correct, and I am now on my second pump.. the first never failed but was making the same noises as the one currently fitted. I believe the issue is down to having a high flow rate pump located in the engine bay. The pump is fine when driving however after being sat parked up after a drive the heat soak from the engine bay causes the pump to scream until cooler fuel from the tank replaces that in the swirlpot. I have never liked the external swirlpot set up, so my plan is to get an oem type plastic in tank swirl pot and fit an oem M3 pump into this. That way I am back to stock for the fuel system. The s50b32 engine needs a pump that give adequate flow at 6 bar pressure when flat out. Unfortunately I cannot find the flow rate of the stock pump. Also the fuel tank does not pressurise. And I am getting a good return of fuel back to the tank, first things I checked! I have a Sytec HP pump and it is so noisey I can here it above the engine noise on tickover when I am sat in my Cabrio. When I sent it back and had it tested Sytec returned it saying it was OK - they could not hear it - they must be deaf! An in-tank solution - for quietness - would be a great find : but I'm not sure what an in-tank swirl pot looks like? I have a plan, just need to move house first before I can drop the tank and have a bit of a play! This might help to track down what you need. I run a 2.0ltr EFi with an in tank pump (ford puma pump) with a sierra jam pot type fuel filter about as close to the fuel rail as I could fit it, filter holds about half a litre. The tank is flat bottomed, no sump and the pump fits snugly into a sleeve that is welded to the bottom, the sleeve has a couple of slots in it close the bottom of tank and the tank has two baffles. Only had one fuel problem when I stupidly fitted a lookey likey eBay pump motor which lasted 5 months, I now have a Sytec pump motor proper job. The only noise is when the ignition is turned on, and that is for a few seconds, after that you cant hear it. I have then removed the hanger rods, top flange and original pump. I have then sourced another pump (Walbro gs340 I think) which will replace the original pump within the Range Rover swirlpot. 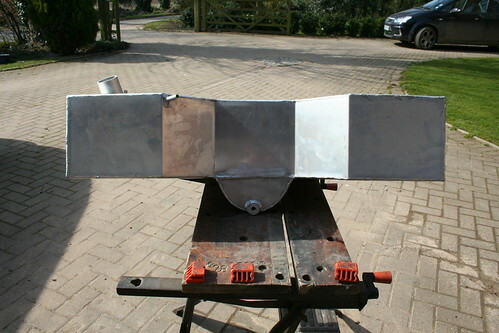 Further to that I have ordered 2 flanges from laser master, one flange will be the top plate which will bolt to the top of the tank with welded on pipe fittings which will connect the feed and return lines, secondly the swirl pot will hang from this top plate and rest on the bottom of the tank. The second flange will have a notch cut out & 6mm studs welded on so it can sit in the tank under the top flange so everything can be bolted up. I am not a big fan of using riv nuts to hold in the fuel pump assembly. Once the parts arrive I will post up some pics and measurements for any one that is interested! Finally got round to making some progress on the above topic. I used the fuel pump mounting plate from an MX 5, and a Range Rover swirlpot. A few hours with a hacksaw and drill and I have the following unit to bolt into the tank. Kit car owners are the Mothers of Invention as Frank Zappa might say. Brilliant conversion, I assume you have checked the continuous delivery pressure at around 3 bars. This could help many others who end up with fuel pump failure, but the only problem is that nearly everyone has their own bespoke fuel system and any ideas can only stimulate a spark in other owners. Safety advice, if you do have a bright spark idea, stay away from the fuel tank. ho ho ho! Hey Phil, thanks for the positive response! The fuel pump is actually an aftermarket Kemso pump ( basically an aeromotive pump but half the price) we will see if it performs or not! Unfortunatley the s50b32 runs a constant pressure of 4.5 bar with a max of 5.3 at full throttle so I had to get a pump that would give a decent flow rate at the higher pressure! Hopefully the set up should work, the return line feeds directly into the swirlpot and there is a non return valve on the bottom of the pot which allows the fuel to fill up the pot by gravity as well. The only annoying thing is having to remove the whole rear panel to get to the tank. What else would you do at Christmas, spending few hours in a subzero garage removing panels and tank unit. It will make you appreciate the glass of your favourite beverage by a roaring fire or for modernists (radiator). I feel I must point out that the higher and lower figures given on fuel pumps refer to (higher) ignition on, and (Lower) when engine running. the fuel Pressure Regulator takes care of stabilising the fuel pressure when you are running. The pump is either on or off as far as the ECU is concerned, the pump has no way of revving up or down with road speed or engine revs. But keep up the good work, it's at times like this when I feel sorry for the readymade tin box brigade who don't have the fun or satisfaction of saying " I MADE THAT "
P.S. my tank is ex aluminium Morgan with ford puma intank pump and a Sierra fuel filter with about 1pt capacity. Doubt if there is another one like it. Hey Phil, thanks for pointing that out but the pressure regulator on the m3 engine (s50b32) is vacuum controlled and changes the fuel pressure depending on manifold pressure. The m3 runs higher than standard fuel pressure so normal working pressure is 4.5 bar ( rather than the normal 3 bar on most injection set ups) but requires over 5 bar on full throttle. Different from any other bmw engine aswell which is just another thing on why the m3 is not a simple engine choice! Just to close out this thread the fuel pump install so far has been a complete success, even with a low level in the tank I have had no fuel starvation issues. Also my fuel vaporising problem caused by the hot temps under the bonnet are gone. There was also a vast increase in low down torque with the higher rated fuel pump fitted which makes me think the external one was struggling to deliver adequate pressure. I would reccomend an in tank pump set up rather than a swirlpot and all the rubbish that goes with it! If you had asked me 16 years ago I could have saved you a lot of time🙄 all I have is an in tank pump ,a jampot sierra fuel filter (0.75ltr) ,no problems except when I replaced the fuel pump motor with a lookey likey one. The moral of the story is, you get what you pay for. Nice job Mac, hopefully an inspiration to other failures, fuel pump that is🤩. If you had asked me 16 years ago I could have saved you a lot of time�� all I have is an in tank pump ,a jampot sierra fuel filter (0.75ltr) ,no problems except when I replaced the fuel pump motor with a lookey likey one. The moral of the story is, you get what you pay for. Nice job Mac, hopefully an inspiration to other failures, fuel pump that is��. But, have you tried to buy a Sierra fuel filter recently? Sierra spares are becoming like hens teeth . And prices are escalating!